He is vengeance. He is the night. He is…Batman! But you’re not; you’re the villain. 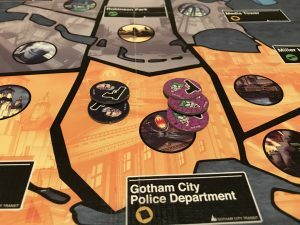 In Batman: Gotham City Strategy Game, you play as one of his rogues and compete for control of Gotham City, all the while trying to thwart the Dark Knight himself. 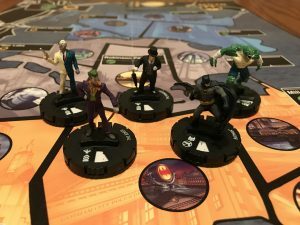 Players choose between either The Joker, Two-Face, The Penguin, or Killer Croc. This choice matters, as each character plays differently. The goal of the game is to level up and, each time you do, you get a new ability of your choice. These abilities reflect their comic book counter parts. The Penguin’s revolve around avoiding a fight and making money. Killer Croc, on the other hand, lives for combat. The first character to achieve level 10 wins. Your current level and the requirement for the next one are indicated on a Clix dial below the figure, which you rotate as you advance. The lifeblood of the game is three kinds of resources: threat, money, and intelligence. Money lets you buy things. Intelligence lets you move your character and henchmen. Threat lets you control turf. Each turn you play a card from your hand. You can either do what it says or choose to collect two resources of your choice. Threat is key to controlling turf. You can collect it on your turn or you can fight over it. If your character moves into another character’s space, you roll dice to fight. The loser retreats and the winner gains threat to distribute throughout the city. No single player uses Batman. Everyone uses Batman. On your turn you can play a card that will require you to draw a Batman card. When you draw a Batman card, Batman comes into play and brings the justice. He might go after your enemies, giving you an edge. But we warned: he might come after you! If Batman loses a fight, he goes back to the Batcave and levels up, becoming more and more dangerous. The theme is fantastic. Batman has interesting and recognizable enemies and it’s a great idea to play out a gang war between them. The characters play like you’d expect them to. Batman is a force to be reckoned with and defeating him really feels like a triumph. The figures are well made. The detail, the paint, everything about these miniatures look great and are a cut above most out-of-the-box board games. Additionally, the figures come with alternate Clix dials so they can be used as Heroclix pieces. The cards are mostly useless. The conditions that trigger them are often so specific that I have a hand full of cards that don’t do anything interesting. In my experience, most players opt for taking two resources of their choice, rarely using the card itself. That’s a major disappointment and drags the game down. The game takes too long. The first few levels come fairly quickly, but the later ones can drag on. If you play this game to the end, it can take two hours and the game isn’t deep enough to justify that kind of time. I recommend picking a lower level cap for your home games. 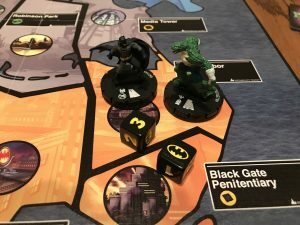 Batman: Gotham City Strategy Game is an incredible idea with lackluster execution. The idea of fighting for Gotham’s streets evokes the imagination but in reality it is often monotonous and uninteresting. This game is okay and Batman fans will probably enjoy it, but the intellectual property is doing most of the lifting here. Overall, this game is a pass. 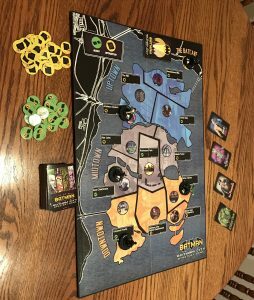 This entry was posted in Articles, Board Games, Review and tagged Batman, Board Games, Gotham City, Review, Tom. Bookmark the permalink.